To enable Voice Insights, login to console with your Twilio account, switch to the Programmable Voice section using the phone icon in the left nav. Under the new Insights (Beta) tab, visit the settings section in the left nav. Choose the checkbox to enable Insights. Click Save. Insights is now enabled. To enable Insights for your subaccounts, switch to the subaccount and enable Insights from the settings. 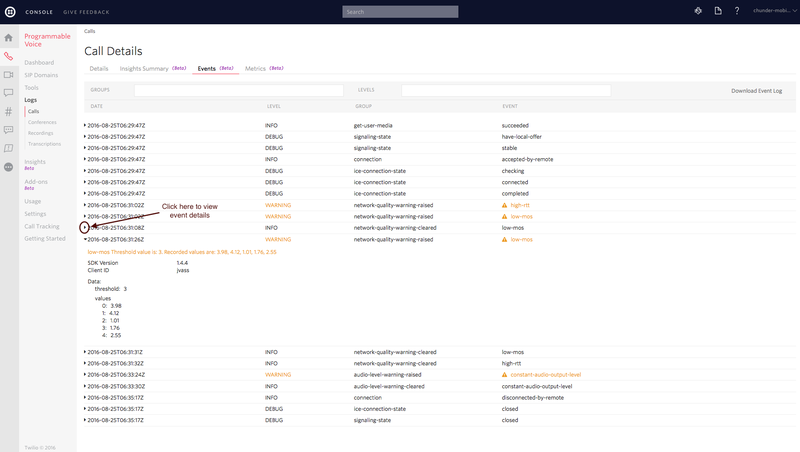 Overview: Dashboard for tracking your KPIs in the selected time range. The metrics presented using the donut charts on the overview page are described below. Failed to connect: Percentage (and number) of these calls that failed to be set up. These could be due to authentication/audio device/permission issues. Terminated with error: Percentage (and number) of calls that disconnected because of an error. The error most commonly results from network degradation. 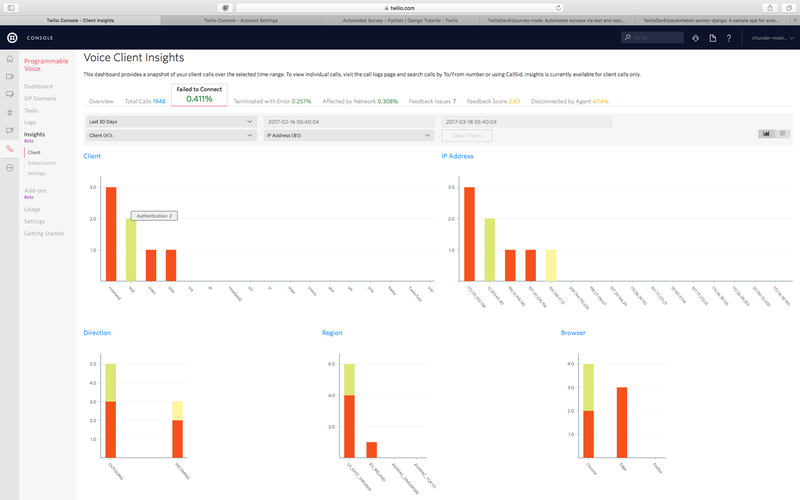 Feedback score: If you are reporting feedback from end users to Twilio using Twilio Client's feedback APIs, you'll see statistics on reported scores here. Feedback issues: If you are reporting feedback from end users to Twilio using Twilio Client's feedback APIs, you'll see statistics on reported issues here. Disconnected by agent: One of the KPIs our customers commonly care about is "Who disconnected the call?". This "Disconnected by agent" metric provides the % of time the call was disconnected by the twilio client user (local/contact center agent). Client: If you are specifying a client name in your connection object, you will see the call data for each client. 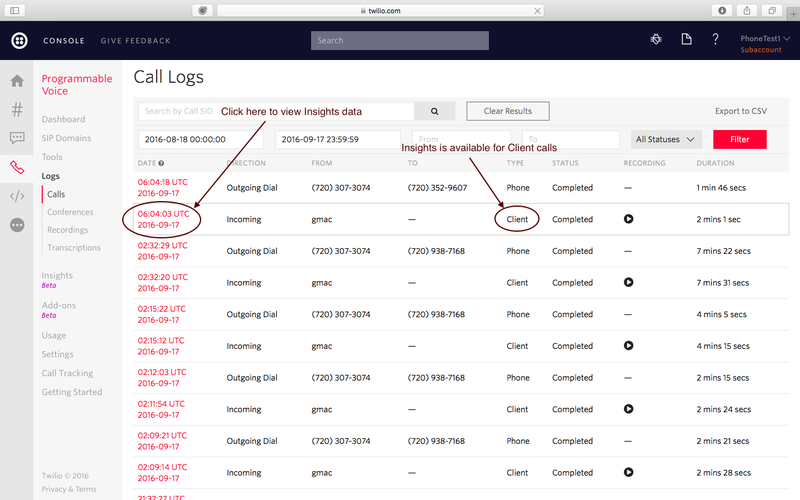 With this data, you'll be able to know which clients are affected most from call errors or deteriorated network. IP Address: Similarly, the breakdown by IP Address enables you to view the affected calls for each IP address. Browser: This breakdown enables you to view call errors by browser. It is specially useful when uncovering certain browser upgrades affect your user's experience. Direction: Provides breakdown of issues for incoming/outgoing calls. 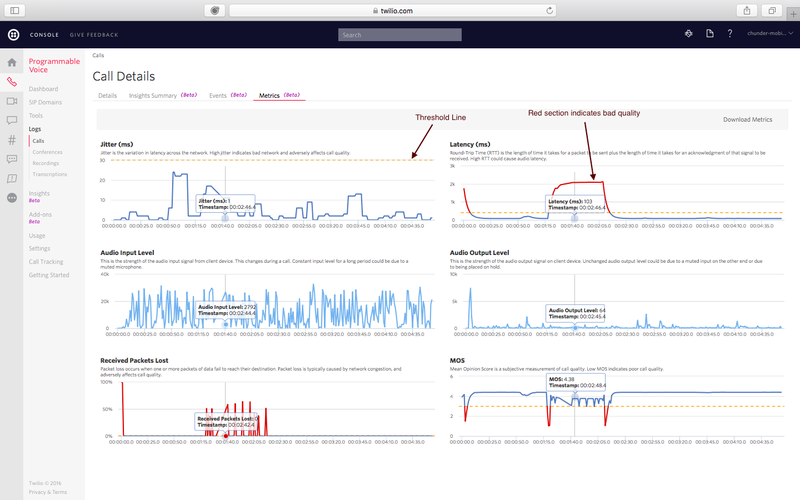 Region: This chart will enable you to isolate call quality issues to the AWS region from which calls are being routed. You can also find calls if you know the To/From number. To find calls using the To phone number, search for the phone number in the filter bar. From the filtered call list, click on the timestamp to go to the call details page as shown above. Now select the Parent CallSid from the call details page. This represents the client leg of this call for which insights are available. To find calls using the From phone number, search for the phone number in the filter bar. From the filtered call list, click on the timestamp to go to the call details page as shown above. Now select the Child CallSid from the call details page. This represents the client leg of this call for which insights are available. The grey section on the metrics graph indicates the metrics recorded at setup time during the first 15 seconds of the call. The metrics recorded during this time do not accurately reflect call quality, and no warning events are generated until the metrics are normalized. 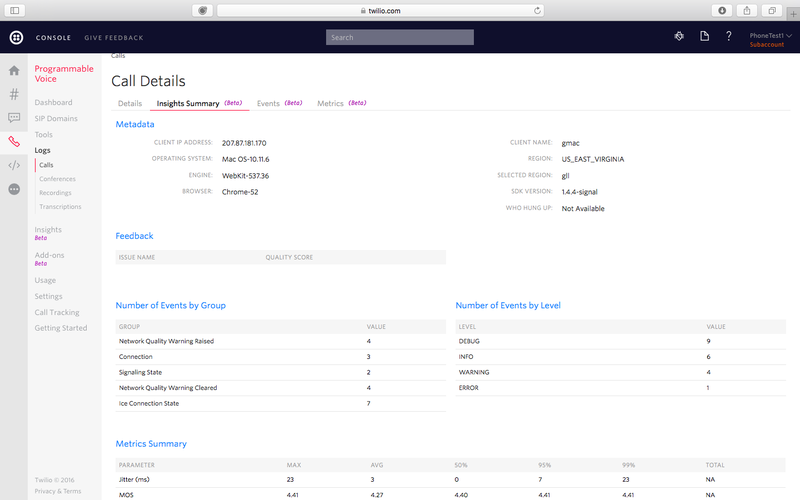 Insights data is available only from the time you last enabled Insights. If you disable Voice Insights, you'll lose access to prior data. We strongly recommend downloading your data using the APIs before disabling Insights.